From 2004 to 2011, corn fell by 25% to 1.5 million tons, rice fell 34% to 650,000 tons, and meat fell by 27% to 300,000 tons from 2004 to 2010, according to research by Mr. Machado, based on scattered available government statistics, as well as data from farmers and food processors. 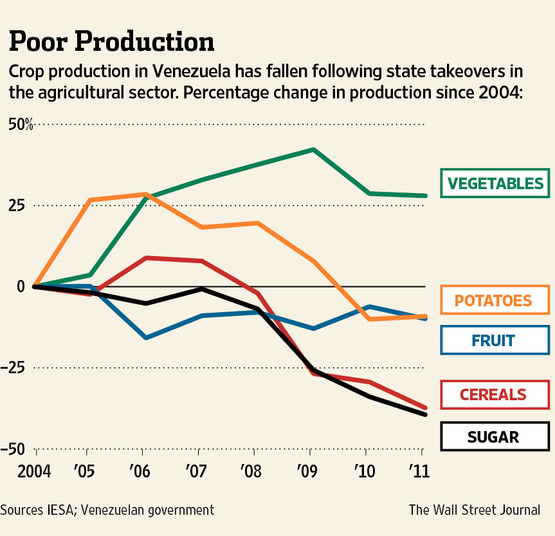 Venezuela’s Ministry of Agriculture hasn’t published food-production statistics since 2008. Requests for an interview and information on exports with agricultural officials received no response. Mr. Chavez told listeners on television this week that food imports are around 20%.